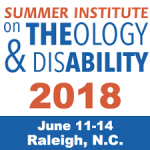 The Collaborative on Faith and Disability will hold the 2018 Summer Institute on Theology and Disability in Raleigh, North Carolina, June 11-14, 2018 in partnership with Duke University. The Institute brings together academics, theologians and others to explore the inclusive intersections of faith and disabilities. The vision of the Summer Institute on Theology and Disability is to expand the depth and breadth of theological inquiry and resources that address and include the gifts, needs, and contributions of people with disabilities and their families to theological learning and religious practice. For more information on the Summer Institute on Theology and Disability, click here. For more information on “Community Day” on June 11, 2018, click here.